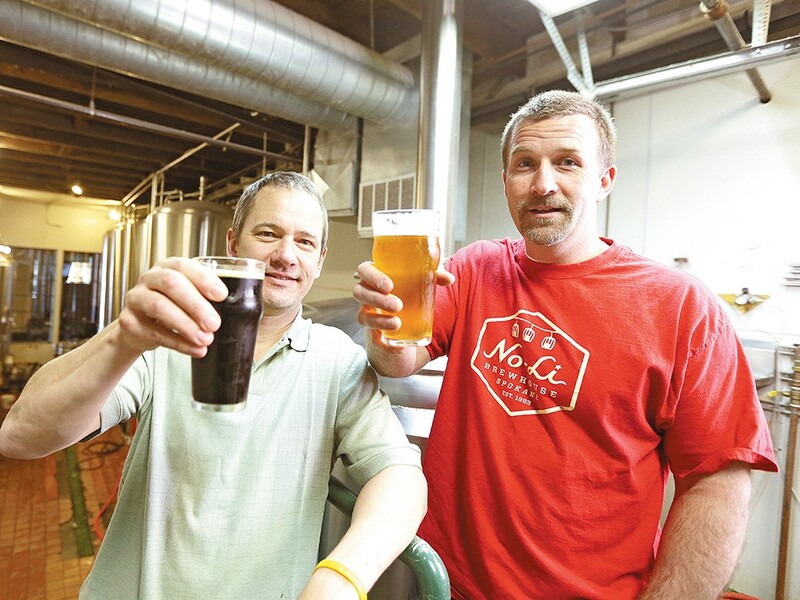 Brewmaster Mark Irvin (left) and partner John Bryant toast their creations inside the No-Li Brewhouse. Mark Irvin swirls his beer. He’ll recommend you do the same. You’re supposed to do this with a beer like the Silent Treatment Pale Ale the brewmaster is holding. It opens up the brew, making it more aromatic and ultimately tasty, he says. No-Li, the brewery formerly known as Northern Lights, has just announced it has received approval to officially classify its beers as “Spokane Style” — an effort to bolster the region’s beer-making reputation — and Irvin’s had a busy day explaining the classification to the media. But for now, he’s kicking back in a far corner of No-Li’s pub, sipping a pint and talking about 20 years of making beer in Spokane. “We’re brewing beers made in Spokane for Spokane people on equipment made in Spokane with water coming from Spokane. Why isn’t this ‘Spokane style’?” asks Irvin, who co-founded Northern Lights in 1993, but rebranded the brewery along with partner John Bryant just a year ago. Since then, No-Li has placed its 22-ounce bottles, each of them featuring a slick design, in stores, arrived on tap lists throughout the region and took home the sort of awards locals have thought the brewery has deserved for years. In 2012 alone, No-Li won a gold medal at the Great American Beer Festival, a gold and silver from the Japan International Beer Competition and three more medals from European competitions. It also got some ink in Esquire, Draft magazine and other local and regional publications. If you go to a Seattle Mariners game at Safeco Field, you can find No-Li’s Crystal Bitter on tap. As he comes up on 20 years with this brewery, Irvin says there hasn’t been a bigger year than the past one. Like most brewers, he started what would become No-Li because — to put it simply — he loved good beer. “When I discovered craft beer — that was at the beginning of the craft beer movement in the late ’80s — I saw this emerging market and I thought it would be cool to own my own brewery someday. And who doesn’t think that way? It’s such a romantic idea,” says Irvin. The beers were good, and getting better, but that didn’t make Irvin and Northern Lights masters of the craft beer industry. Irvin readily admits that his skill set lies in the brewing process more so than marketing and selling the end result of his labors. That’s where Bryant came in. A veteran of successful breweries like Deschutes and Oskar Blues among others, Bryant was looking to relocate his family back to Spokane and gave Irvin a call. Things fell into place for Bryant to come on as a partner and soon the push was underway that resulted in the rebranding as No-Li, the sales boom and an in-progress expansion at its Gonzaga-area pub and production facility that will effectively double the brewery’s output to as many as 6,000 barrels this year. In many ways, it was a boots-on-the-ground effort to increase the profile of not just No-Li’s beers, but Spokane craft brewing as a whole. They actually went out to local stores and chatted it up with people in the beer aisles. “We had 20,000 conversations in the first six months our bottles were in grocery stores. Four nights a week we’d go out and talk to people about our beer and the craft brewing community,” says Bryant. Not only has No-Li has been pushing the boundaries of its own production and creativity, the brewery has also become the de facto leader of a renaissance in Spokane brewing. While the craft brewing industry is competitive, it’s also collegial, and No-Li isn’t shy about engaging its fellow local brewers. Bryant is active in the Inland Northwest Brewers Association, which brings together Spokane-area and North Idaho breweries and has been making trips to Olympia, lobbying against a proposed beer tax that could deal a $15-a-barrel tax increase to brewers. That hike, Bryant says, would be passed on to consumers and bring a halt to what’s been a remarkable boom in craft brewing in this region. At times, it seems that Irvin and Bryant are almost as concerned with repping Spokane’s brewing potential as they are with their own bottom line. “Spokane is rapidly approaching a beer destination, and it will become one. With all the startups and the new players out there brewing creative beer and doing a great job of it overall, I’m hoping that Spokane could become like Bend, Oregon, or places in Colorado where craft beer is an integral part of neighborhoods,” says Irvin. This could mean jobs, increased tourism and, as the No-Li guys see it, a better city.